Heat a fry pan over medium heat with a generous amount of olive oil and the butter. Fry the red onion and sage leaves with the salt, nutmeg and pepper until the onions are soft and golden. Break up the bread in to a bowl and pour in white wine. Add chopped parsley, currants, pistachios, garlic and lemon zest. Add cooked onions to the bowl, give it a really good stir and set aside. It will be more moist than usual stuffing. Place pork flat on your bench, skin side down. Spread the stuffing evenly over the surface, right to the edges. Now start rolling the meat tightly, end to skin, so that you end up with a snail log of meat. Tie the log with butchers twine at 2 cm intervals down the length of the pork, then rub with the lemon juice, some olive oil and salt. Instead of baking the pork on a rack in a roasting pan, chop the apples, carrots, onions and celery and use them to elevate the meat. As the pork cooks, the vegetables not only release flavour into the meat, but make a great flavour base for some pan gravy. 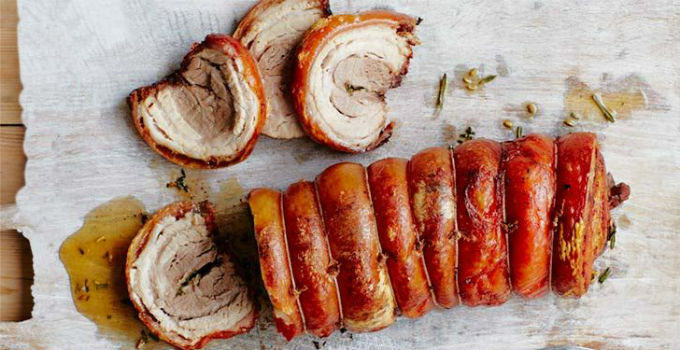 Pop your pork into the oven for 30 minutes, until the crackle, crackles. Reduce the oven to 180C and cook for a further 1.5 hours. Remove the meat from the tray and rest for half an hour. Meanwhile, place the roasting tray over a medium heat on the stove top. Sprinkle over flour and stir and scrape with a fork to dislodge all the dark bits from the bottom of the tray. Pour in stock a little at a time. Bring to the boil and cook until thickened to a gravy consistency, stirring consistently so no lumps form. Strain the gravy through a sieve, pressing with a spoon to squeeze out every drop, then discard the vegetables. Add any juices from the pork to the gravy that have been captured on your resting tray. Stir well, season to taste and pour into a gravy jug. Remove the string from the pork and slice, ready to serve with crunchy roast potatoes, apple sauce and sautéed greens.